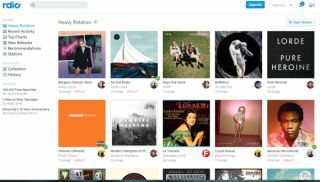 Music streaming service Rdio won't carry a pesky time limit on how long you can listen to songs for free through its US website, the company has announced. Its ad-supported Rdio Free option gives web users the same unlimited streaming perks as its now confusingly named paid Rdio Unlimited option. This narrows the major differences between Rdio Free and Rdio Unlimited when listening on a computer. Basically, the subscription-based option doesn't include ads in exchange for a monthly $9.99 (£14.99, AU$20.99) fee. Outside of the web, Rdio only lets Rdio Free users listen to stations on mobile platforms, giving paid-up iPhone, Android and Windows Phone 8 subscribers complete access to its 20 million songs. Rdio's decision to abandon listening caps for its free music streaming option doesn't come as a surprise given similar decisions by its rivals. Spotify also eliminated time limits when streaming ad-supported music through its web player and desktop apps January 15. It's more than a Rdio vs Spotify rivalry, though. Both services are tempting to win over music streaming converts who are using Pandora, iHeart Radio, TuneIn Radio and Slacker Radio. Rdio and Spotify are also trying to get out in front of newer platforms like Beats Music and Apple's iTunes Radio on iOS 7 before they gain a wide amount of traction. We asked Rdio if it plans to bring free web streaming to other territories, and will update this story when we learn more. Pandora gets personal on iOS and Android, adds artist recommendations.